For many of us, dealing with hard water is a daily challenge. Hard water deposits gradually collect on plumbing fixtures and inside pipes through daily use. These deposits can affect the function of your fixtures and can be quite unsightly. To keep faucets and fixtures looking nice and working correctly, it’s a good idea to clean hard water deposits regularly. There is no need to purchase special cleaning products because regular white vinegar (sometimes with the help of vigorous scrubbing) will do the job. Kitchen and bathroom faucets can quickly accumulate hard water deposits anywhere that water tends to collect. This can make even a relatively new faucet look old and dingy because everyday cleaning doesn’t remove the buildup. Use vinegar to help loosen the hard water film and buildup before scrubbing. 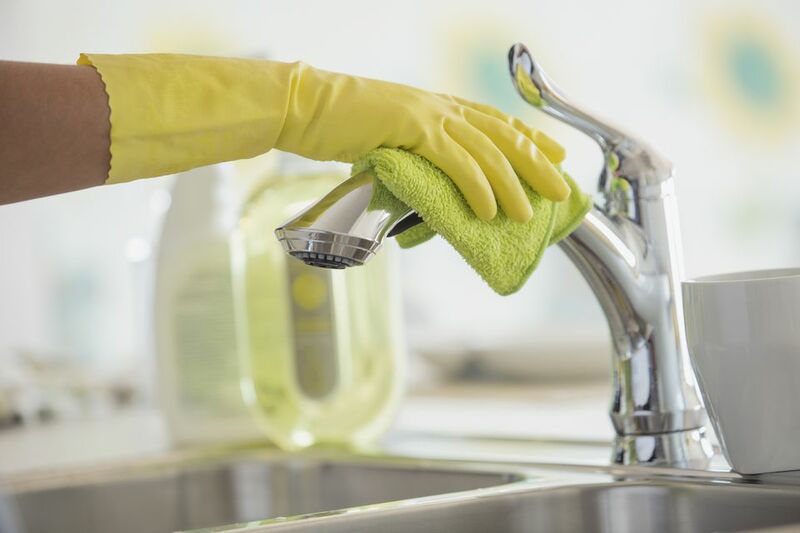 Soak a clean rag in vinegar and drape it over the faucet, making sure there is direct contact with all of the hard water deposits. Let the rag sit for at least 30 minutes; an hour is better. Remove the rag and use a non-scratch sponge to scrub the faucet, focusing on areas with the most buildup. Repeat these three steps as needed to remove all of the hard water deposits. Note: Prevent scratching the faucet's finish by using only non-scratch sponge or pad along with plenty of water. Even a non-scratch sponge can scratch the finish if both the sponge and the faucet are dry. Although hard water deposits in a faucet aerator may not be visible, they can affect the flow of water. If you notice that your water isn’t flowing the same, or it has reduced water pressure or an erratic spray, it is likely that the aerator is clogged. Remove the aerator carefully to prevent scratching or denting it. Disassemble the aerator, paying attention to how the parts fit together. Remove any loose debris from inside the aerator and rinse it out with water. Then soak it in vinegar for at least 30 minutes, preferably overnight. Use a small scrub brush or old toothbrush to remove any remaining debris from the aerator screen, and rinse it with water once again. Reassemble the aerator with the parts in the same order as before. Screw the aerator back onto the faucet and test the water flow. The techniques for removing hard water deposits from a toilet, a porcelain sink, an enameled tub or ceramic shower tile are similar, even though each of these is a different material. All of them are very tough but can be scratched by metal tools or aggressively abrasive scrubbers. Apply vinegar or a mixture of vinegar and Borax, then scrub with the most effective sponge, pad, or scrub brush that won't scratch the finish. You can even use ultra-fine sandpaper or 0000 steel wool on most toilets, enameled tubs, and tile. If you are tired of dealing with hard water and the various problems it causes, consider installing a water softener system to treat your home’s water supply.